It’s a common misconception that losing weight is hard. While it certainly has its challenges, the reality is that you simply need to make sure that you’ve got the right piece of technology to help you out. Do you want to know the best option for the job? The Bluetooth Smart Body Fat Scale by Weight Gurus. This is a sophisticated scale using cutting edge technology to help you get in control of your journey. This scale is going to offer you a backlit display that tells you what you need to know without having to squint to see it. From there, it’ll connect to your smartphone or other device via Bluetooth and tell you all of the relevant details. For example, you’ll see your BMI, the percentage of your body fat and muscle mass, it all be made available on your phone instantly. Perfect for helping you attune your workout and eating habits to get those percentages where you want them, this is going to be an innovative and interactive way to lose weight for good. Focused on all of the newest technologies to offer you control, this is the ideal scale for your weight loss journey. Imagine that you are looking to get some weight off but you’ve tried every diet known to man and every workout that you can possibly handle only to go up, or to go down 2lbs in 3 months. It’s frustrating. No, it’s more than that – it’s embarrassing. Here you are, doing everything right and focusing on the most important elements to help you lose weight and it’s still no good. So, what do you do? You need to take a look at the Bluetooth Smart Body Fat Scale by Weight Gurus and see how it’s going to help you educate yourself on weight loss so that you will be able to get that number moving in the right direction and helping educate you at the same time for the results are going to be accurate and educational for you. You start off your program with, say, 60% body fat and 10% muscle mass. Let’s say you weight 250lbs. Your ideal with is to be 150lbs and have a significant amount of muscle mass. So, using this Bluetooth scale, you’ll be able to keep an eye on all of the elements. As you being your healthy eating and exercise, you’ll see your muscle mass percentage go up as you gain muscle. Your overall weight may creep up to 253lbs, but you can see that this is because of the muscle mass you are getting. After a while, the body fat percentage starts to decrease and your weight goes back to 250lbs. Then continues to drop. You’ll be able to see your BMI going into a healthy range. 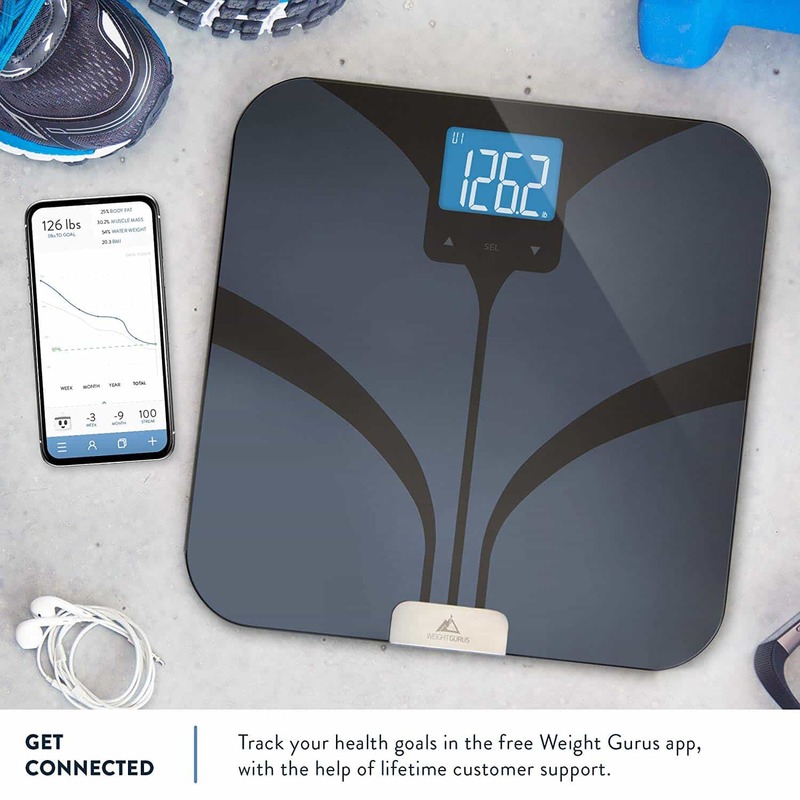 When you are looking to lose weight, the Bluetooth Smart Body Fat Scale by Weight Gurus offers you control over how you are gaining or losing weight so that you can track your progress properly and learn as you go.